URGENT MESSAGE: There is currently a delay in payments for the New York population of the Northeast Carpenters Funds. Thank you for your patience during this transition time. MHC is contracted with employers and unions to manage their “carve out” behavioral health benefits. These are self-funded ERISA Plans; we are not an insurance company. We provide case management, provider network access, and claims administration services for their members and dependents through their Mental Health and Substance Abuse (MH/SA) Benefit Plan. One of our roles is to process Mental Health and Substance Abuse claims to the Health & Welfare Funds for reimbursement. Thank you in advance for your patience during the standard processing time frame of 6-8 weeks. For detailed claim requirements and submission instructions, please download claim instructions and provide your biller with a copy. If you are a provider or facility with questions regarding payments that you have received, please complete an online Payment Inquiry Form. Providers are responsible for tracking their claim submissions and managing their own payment records. Payments and denials will be sent to you directly by our payers and include an Explanation of Benefits. We recommend that all payments and payment correspondence are communicated to all parties involved with the billing and bookkeeping processes within your organization. Our payers do not offer payment details after notification of cleared checks are received. 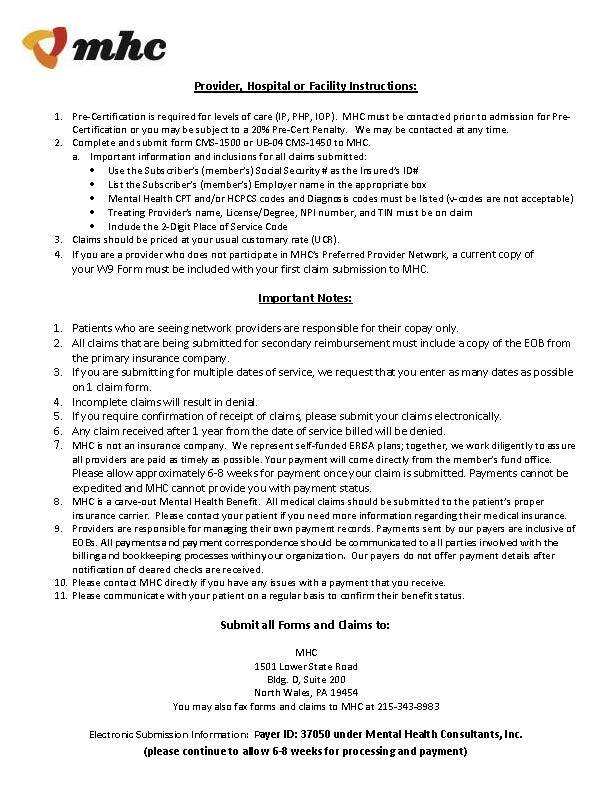 MHC does not confirm receipt of claims. If you require confirmation, please submit your claims electronically or by certified mail. For more information on electronic claim submission, please click here.